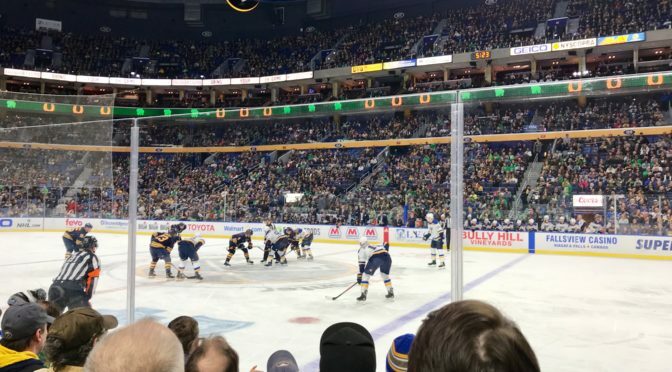 It wasn’t the first time I watched the Buffalo Sabres play at home. So long ago that the were still playing in the Aud. The Hockey Wanderer origin story comes out of Western New York. 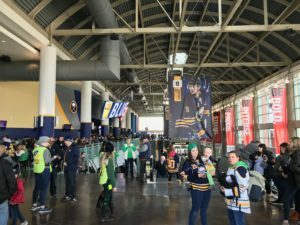 An Elementary-school kid, less-than-ideal family life, bouncing around from school to school, who found a new obsession to help keep his mind off his troubles: the Sabres. I watched the games on TV, I read about them in the Buffalo News. I listened to them on the radio where the play-by-play calls fired my imagination was fired and WGR-55 gave me the mistaken impression that “Sabre Dance” was a team jingle rather than a seminal piece of 20th century modern music. And I will never forget the Christmas present I received when I was nine years old: tickets to the Sabres game four days later against the Detroit Red Wings. 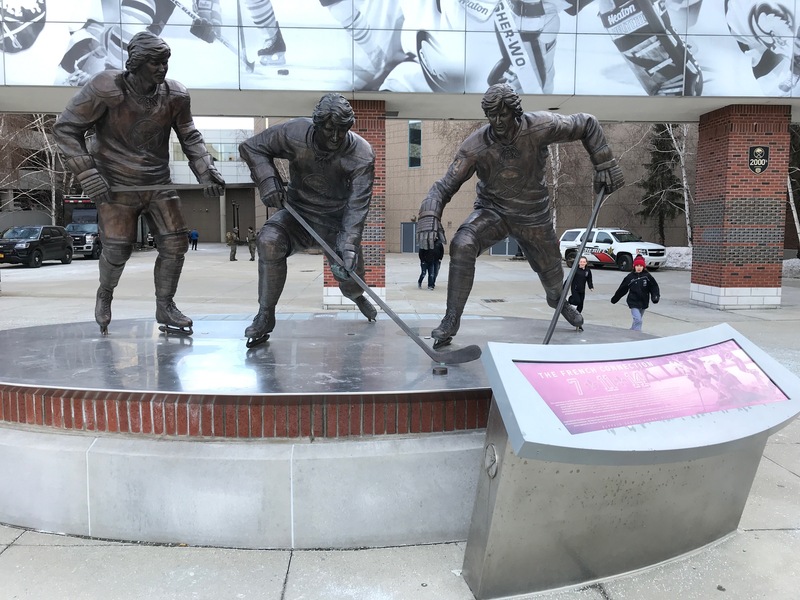 The public skates on the site of the old Aud. As it turned out, I didn’t really see the game. It wasn’t until the next year that my fourth-grade teacher deduced I was nearsighted, and quite dramatically so. I was basically taking in a white blur, surrounded by the Aud’s gold seats. My dad never took me to another game in Buffalo. Having his car broken into during the game probably put a damper on the occasion for him. It was a cold ride back to Niagara Falls in late December without a passenger window.1My mom took me to a game at the Aud a few years later. A 7-3 rout of the Leafs. So the Sabres are undefeated in home games I attend. Anyway, life took me away from Western New York by middle school. I’ve remained a fan, even though my other ties to the area are gone. I’ve seen the Sabres play far more often in Hartford, then later in San Jose. But it was time to go back again. Not that it’s the same home — the Aud is long gone. 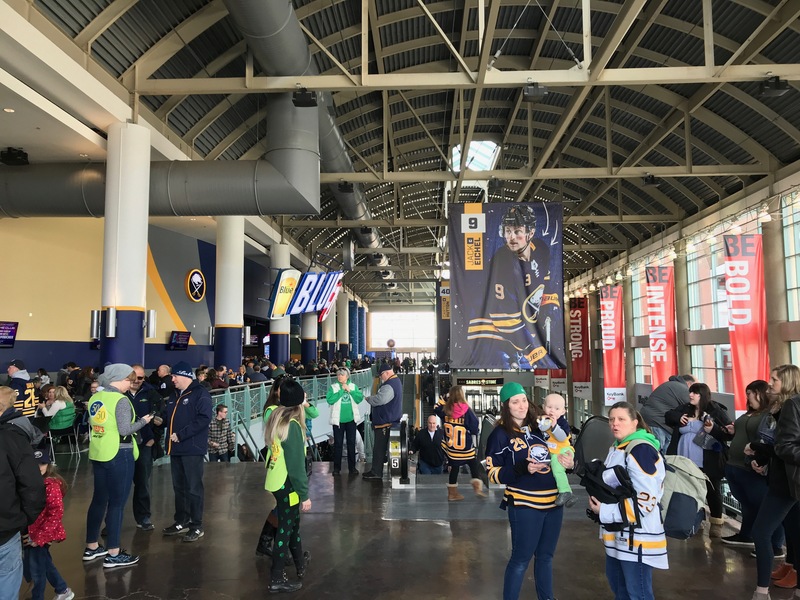 As for the two-decade old Marine Midland Arena HSBC Arena First Niagara Center2The sequential name changes to the Sabres’ arena tell a tale of consolidation in the banking industry, much as the San Francisco Giants’ ballpark did for telecom. KeyBanc Center, much of the local commentary about it is about how much of a dump it is. Given those low expectations, I was pleasantly surprised, though my impressions may have been favorably influenced by good seats I picked up inexpensively on StubHub amid the debris of another blown season. 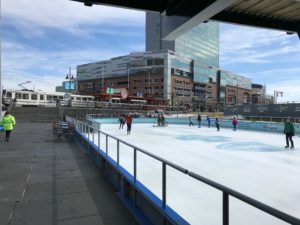 The arena’s surroundings appear to be rounding into shape, taking advantage of the waterfront location to create a pleasant public space. The large, glassy atrium at the entrance offers a better transition between street and seat than I am used to. There appeared to be a wide variety of food, but I didn’t try any after sating myself before the game. But some of the griping is justified. The seat was uncomfortable. My knees were jammed into the seat in front of me, and my chair looked like it has seen more than a few wet clean-ups. The weird thing was, it was a great hockey game. 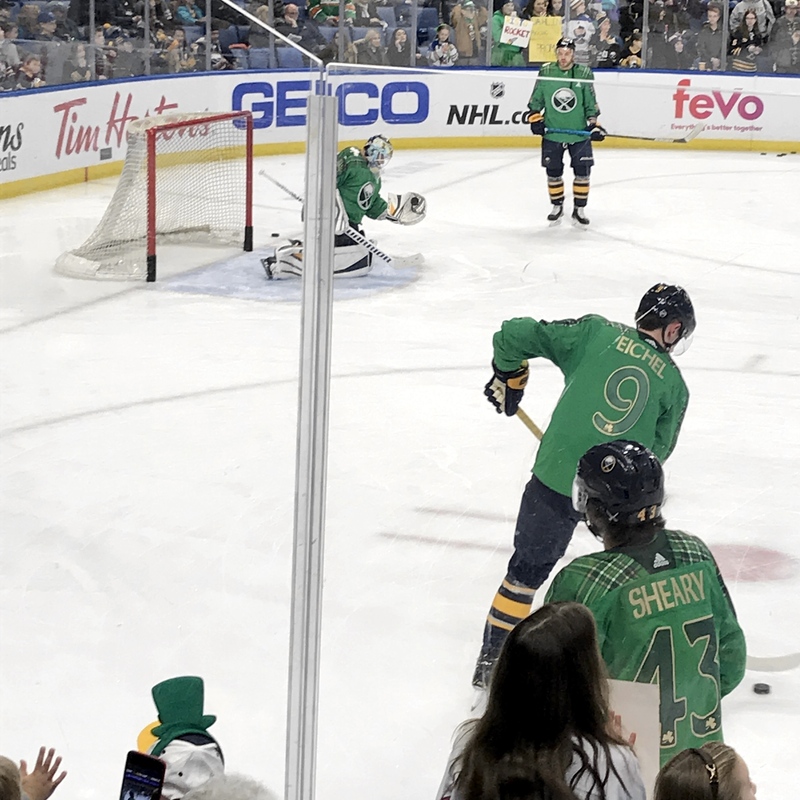 I mean it shouldn’t be weird, but this is the Buffalo Sabres, a team sportswriter John Vogl recently and correctly described as being in the midst of an eight-year-long tire fire. But the Sabres went against recent form and came to play against a tough opponent in St. Louis. They held possession on offense and passed successfully. They were willing to fight for the puck in the corners, and they were willing to get physical, most notably on a third-period shift when every non-goaltender on the ice landed at least one solid check against the Blues, generating a rousing ovation. Maybe I’m their lucky charm. It was a 5:00 start on St. Patrick’s Day, and the Sabres celebrated for their drunken fans with special practice jersey that was a dog’s breakfast of Irish tropes. I’m used to being among many Sabres fans attending games on the road. Here in Buffalo there were a truckload of Blues fans. Game wrap ups here, here and here.